My girlfriend loves fossil watches. So i had to buy this for her. Black with like a pearl accent. Perfect for her. Stainless steel case and bracelet with black acetate center links. Crystal accented bezel. Black dial with rose gold-tone hands and crystal index hour markers. Roman numerals mark the 3, 6, 9, and 12 o'clock positions. Quartz movement. Mineral crystal. Push/pull crown. Case: diameter 30mm thickness 9mm. Band: width 7mm length 7.25in. Pushbutton clasp. Water resistant up to 50 meters/165 feet. Functions: hour, minute, second. 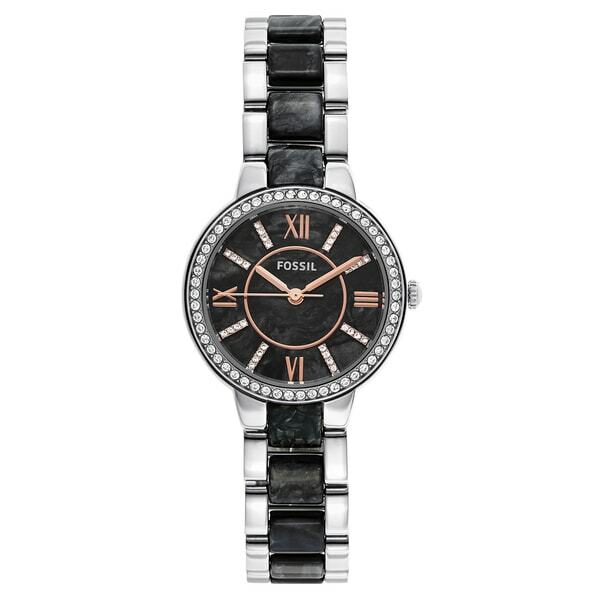 Fossil Women's ES3918 Virginia Black Dial Two-Tone Bracelet Crystal Accented Watch. Dimensions Case: diameter 30mm thickness 9mm. Band: width 7mm length 7.25in. This is a beautiful watch. I love the contrasting colors of silver and black. The crystals are an added plus. It is great for everyday use or going out. I expected a black w/silver watch but surprised to find it is a black marled look! Still nice but I would have preferred a pure black look. After a months wearing the strap broke completely off and could not be repaired. I also had trouble reading the time because of the fossil effect on the face of the watch. I am sorry I could not enjoy this watch because I really liked it as far as looks and feel. I love black so this is the perfect watch. Very high class looking for the price. I bought this watch for my daughter. She is 37 years old and is not into "too much bling"...she just loved this watch!! It has class,comfort, style and goes with everything she wears. It also looks fantastic on her wrist!! I am pleased..it was a great find for me. There is an eleven year guarantee you can sign up from fossil. I love this watch. It has a sleek and fashionable design. It really pairs with every outfit. don't like splotchy look. prefer solid black. Love this watvh. Dainty for a women but sturdy. I receive many compliments on this watch. This watch looks amazing on! It fits perfect. Overstock.com had the best prices for two wanted watches and it's the only website with both having the lowest prices and both watches.